Go from free-form ink to Office shapes, text, or a mathematical expression in a couple of strokes. You can also scribble the title of a slide with your pen. When you do this, PowerPoint automatically offers to convert the ink to standard text. These features are available to Office 365 Subscribers on Windows and iOS. The Ink to Math feature is only available to Office 365 subscribers on Windows right now. Draw or write in digital ink. On the Draw tab, choose Ink to Text, Ink to Shape, or Ink to Math. Click an drag to enclose the ink drawing you want to convert. The ink is converted as you've specified, and a Convert Your Ink button pops up to give you more options (shape or text variations). Tap the object you want. Repeat steps 4 and 5 until you've settled on the format that you want. Select the ink by tapping or by using Lasso Select . The Convert Your Ink button pops up. Select the kind of conversion you want. As you point at each conversion option, the selected object gives you a preview of how it would look. Tap to choose the one you want. Tap the Convert Your Ink button to see other conversion options—one of which is to revert to your original ink strokes. Open any Office 365 desktop application on Windows, go to File > Options and select the General tab on the Navigation pane to the left. 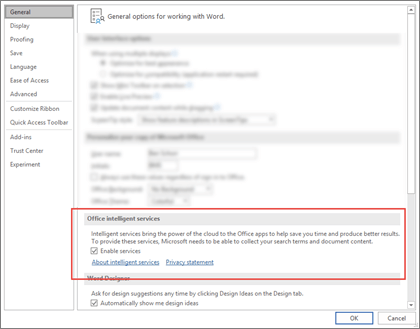 Scroll down a bit and you'll see the Office intelligent services section where you can enable, or disable, Intelligent Services. For Ink-to-Text conversions, right-to-left languages are not currently supported. See Languages supported for ink-to-text conversion for a complete list of supported languages. This is a subscriber-only, Office 365 feature.